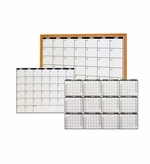 Dry erase boards in the house are a great and fun way to keep track of the family schedule appointments, activities homework, chores or whatever else we have going on in our hectic lives. 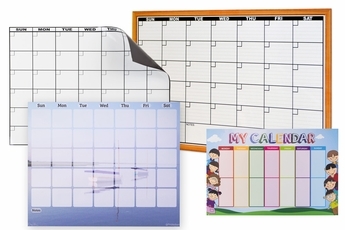 You might find that you have a lot of options out there for home dry erase boards; they can be found in the big box stores the office supply stores and seemingly everywhere but there are a few things that set our boards apart from those. First, our boards are made here in the US in our own factory using quality materials. We are a whiteboard company, we make and sell dry erase boards and know that not all whiteboards are created equal. Our whiteboards feature our very own Opti-Print™ which means that we print full-color high resolution graphics under a premium ghost-free dry erase surface that will erase cleanly every time. We can also print customized designs for you on any of our whiteboard styles including dry erase magnets, decals and wall mounted boards. 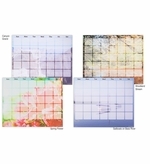 Want to personalize the fridge calendar with that great photo from the family vacation? We can do it, and they make great gifts too. In fact we can print just about anything and we don't have minimum quantities and we don't charge outrageous setup fees. You can get started here online or you can give us a call at our toll free number and we can get started. 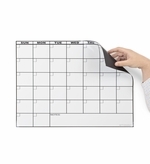 17 x 22 Magnetic Calendar is a great way to keep track of activities & homework. Featuring choice of four colorful nature scenes.